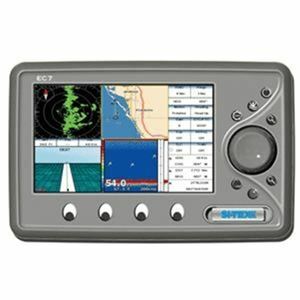 Click the button below to add the Sitex EC7 GPS Chartplotter with Internal Antenna to your wish list. Standalone Chartplotter with Radar and Fishfinder Capability. Sitex introduces its new 7” High Definition GPS/Chartplotter. The EC7I includes an internal GPS antenna and the bright 800 x 480 high resolution screen provides a great picture whether looking at the chart, optional fishfinder or optional MDS radar dome. Combine the ability to hold 10,000 waypoints/marks, 50 routes of 50 waypoints and a tracklog of 10,000 points to everything in the EC7 and you have a solid navigation system that will last years and keep track of all your hidden spots. The ultra-fast processor of the Sitex EC7 quickly goes through screen redraws while showing highly detailed C-Map’s Max charts. Additional functions can be added to the Sitex EC7 like AIS, Radar and fishfinder. By using NMEA 0183 data from the included power data cable you can interface your VHF radio to send your coordinates through Digital Selective Calling (DSC), or just use the optional DSC VHF radio for Buddy Track Capability, you can also link to an EPIRB so search and rescue will have your coordinates when the signal is received. The Backlit soft keys, and an easy to use on screen menu system, make the EC7 a powerhouse unit that is affordable. For value and flexibility the Sitex EC7 fits the profile, offering expandability with the addition of optional sensors, a 7” Daylight Viewable high resolution screen that is large enough to split, and still make out the detail for viewing on both sides of the screen. The EC7 offers solid chart plotter functions that the newest or most experienced navigators will find easy to use and provide the directions to port or that special spot where the fish are biting. Each Sitex EC7I comes with: EC7 Chartplotter, One Pre-Programmed C-Map Max US Region, Plastic Cover, Quick Release Mounting Bracket, Power Cable, Video Input Cable, Manual and a Two-Year Warranty. Includes One C-Map Max Chart Wide Area US Chart. Sunlight Viewable 7” Color Display. Stores a whopping 10,000 Waypoints. AIS Compatible for Overlaying AIS Data on the Chart.